I was hoping to get all my 2014 evaluations done before the end of January but that doesn't look like it's going to happen. Anyway, here's a look back at another of my 4 huge raised beds. In case you haven't noticed I'm not doing them in order, I've covered #4, #2, and now I'm on to #3. This bed looked pretty bleak at the beginning of the year. The Greek Gigante beans were looking dead, and anything else that had any signs of life were covered up with Agribon to protect them from the birds. Things were looking better at the beginning of February, I had pulled out the Gigante beans, which weren't actually dead, most of the plants still had big fleshy roots that probably would have sprouted in the spring. But the beans had to go because I had other plans for this bed. That's an experimental patch of Red Fife wheat taking off in the foreground. The long low tunnel is protecting various greens that are just germinating. And the fabric covered trellis is covering some snow peas. 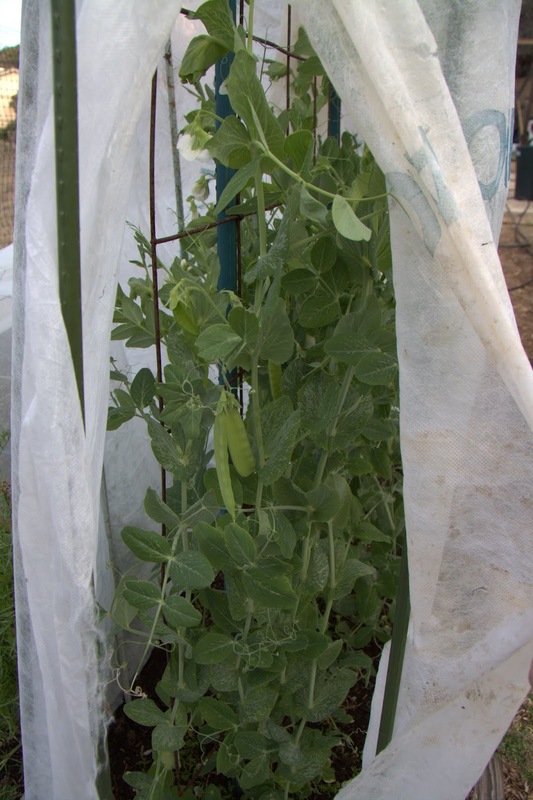 The snow peas were holdovers from a late autumn planting and survived a few freezing nights with the help of an additional covering of frost cloth, the plants produced 1 1/2 pounds of pods in February. Here's a look at the greens getting going, they included two types of Arugula, mizuna, pac choi, three varieties of spinach, and there's still room for some transplants. Before the end of the month I had another tunnel up and planted out with different greens and saladings, including beets, rapini, pea shoots, and lettuces. A glance at the tunnel in late March shows obvious signs of greenery, some of it overgrown because I had been travelling a few weeks and nothing got harvested. If the plants weren't enclosed in the tunnel the good bugs would be feasting on rapini flowers. By the end of April the wheat patch is looking a bit sad, there's spots where the plants are looking small and they are yellowing. There's plenty of activity still going on in the tunnels. Including some pretty good looking lettuces and beets. By mid May the wheat is starting to look decidedly sorry, it's stunted and barely forming any heads. What I didn't realize at this time is that the bed was being invaded by oak roots because I didn't line this bed with a root barrier when I filled it. The oak roots were out competing the wheat for water and nutrients. The weather turned unusually hot for May so I topped the tunnels with some Agribon to shade the greens growing inside. Do you see the carrots blooming at the end of the bed? Those are some Spanish Black carrots that I had sown there on March 25 of 2013. Some of them had bloomed at the end of 2013 but frost killed most of the developing seed heads before the seeds matured. I cut the tops down and left the roots in the ground and the plants grew back with a vengeance in the spring. I was pretty good at sowing successive rounds of greens and saladings through the year. And what a surprise, I was harvesting strawberries! After the year of the rat (2011, see the tally of kills on my sidebar) I thought I would never be able to grow strawberries again. That year the rats feasted not only on the berries but they ate the plants too, I had to rip out all the plants so as not to feed them. Ah, there's a little better look at those burgeoning carrots. Those blossoms were an absolute magnet for bees and beneficial insects, as were the arugula and coriander blossoms. I was not so good at keeping on top of the chard harvests, they threatened to burst out of the tunnel much of the time. I eventually gave up on the wheat and pulled it out, chopped it up, and into the compost it went. It was when I prepared the end of the bed for squash that I found all the oak roots, so this area got a thorough digging. The squash didn't seem to mind the competition as much as the wheat did. The trellis has two Tromba D'Albenga squash planted at the base and in front of that are two Honey Nut butternut squashes. The space could have easily supported 4 Honey Nut plants because they are fairly small plants for winter squashes. This year I'm going to train they up trellises. I had harvested Sweetie Baby romaine lettuce through May from this space but didn't get around to replanting anything. There was some escarole in the bed also but it bolted without forming any decent heads. There was a bit more lettuce to get me through July. The new squash vines were climbing and trailing all over the place by mid August and the January sown fennel was reaching for the sky. I planted out a couple of Green Fingers Persian cucumbers at the end of the bed after clearing out the carrots, arugula, and coriander towards the end of August. The carrots dropped seeds all over the place when I harvested the heads (which I've still not cleaned, tsk tsk) and I've been harvesting the volunteers for a while now. More lettuce, some gai lan, and beets going at the end of August. The other tunnel had more than enough greens going to keep me harvesting about every week to ten days. This is just before I went through and harvested, more often than not it seemed that I took the camera out to the garden after I harvested but shot was too pretty to miss. The butternut squashes were quick to set a crop. This was one of the larger squashes. Not the best photo, I didn't seem to take many shots of this bed in September, but you can see how the Tromba squash has covered the trellis and the butternut vines are already dying back and the fennel is sprawling all over the place. I let the fennel stay because I didn't have a lot of flowers left in the garden to attract beneficial insects. The dreaded Bagrada Bug had shown up for the first time and I had pulled out most of the sweet alyssum in the garden because it is extremely attractive to the Bagradas and alyssum is was my mainstay plant for drawing in the good bugs. The summer sown lettuce looks pretty good here, but it succumbed to heat and powdery mildew. The Sweetie Baby bolted before I was ready to harvest it and the butterhead had a lot of soft brown spots inside the heads, although I was able to rescue some of it. The cucumbers were thoroughly happy though and quickly covered their tower. The same goes for the productive Tromba squash. The butternuts have been harvested and cleared out. 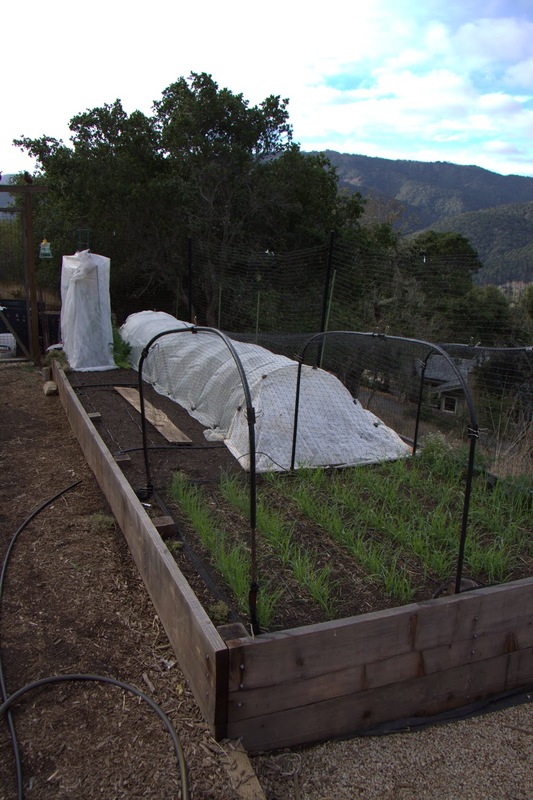 By the beginning of November I had cleared out this tunnel and direct sown various radishes, baby turnips, rapini, and Cilician parsley. These are transplants of spinach that was started in paper pots. The cucumbers were still producing. Green Fingers seems to be very resistant to powdery mildew, they were barely fazed by it through the autumn. I was still harvesting Tromba squash as well, another PM resistant variety. It also helped that we had a long and warm autumn. The squash and cucumbers went into a pretty quick decline in November, although they still produced some small harvests. But the new plants in the tunnel were happy. 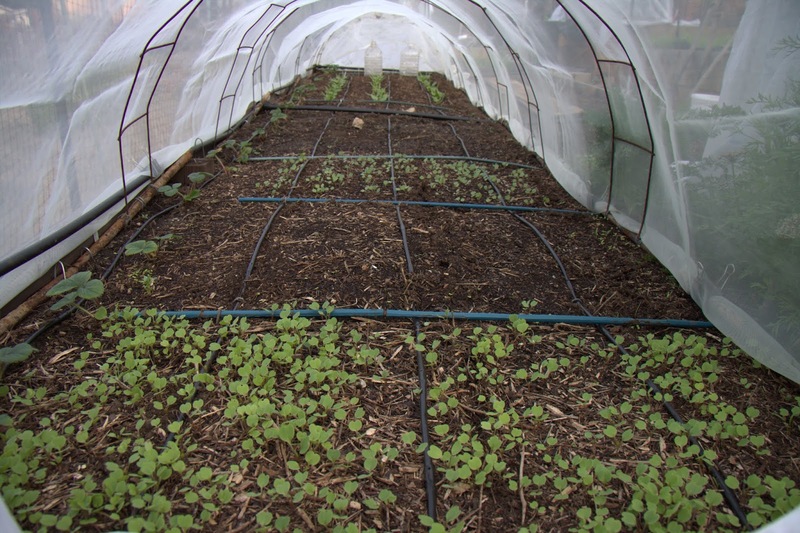 The other tunnel also had some lettuce and beet transplants off to a good start. Here's the bed on the last day of the year. The squash and zucchini have been removed and the fennel has been cut down. The jugs are full of water and warming in the sun. We had had some freezing nights and I used the jugs of water to help protect my celery from freezing. I put the warm(ish) jugs of water in amongst the celery plants after sundown and covered the plants with frost cloth. I don't know if that tactic actually helped but the celery did come through the freezing nights unscathed. 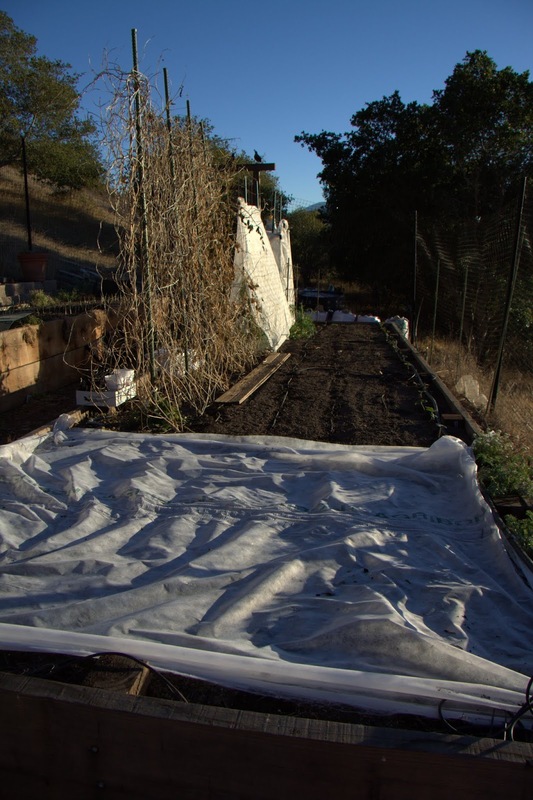 You can see that there is also some frost cloth pulled aside and hanging in the path, I used that to give the greens in the tunnels some added freeze protection as well. The lettuces were coming along very nicely at the end of the year. And the greens in the other tunnel were looking quite good too. All those lovely veggies in the tunnels shrugged off those freezing nights and have given me a nice steady supply of goodies for the past month. I'll not be replanting anything in this bed for now because in the next few weeks I need to shift the soil and lay a root barrier on the bottom of the bed. I won't have to remove all the soil at once, I should only have to remove about 25% of it, lay down the barrier and then shift the soil from the next section onto the barrier and so on until the task is done. Then the entire bed will be sown with a cover crop mix and prepared for planting out solanums at the end of May. The harvests were light last week because I was unusually busy and just didn't have time to spend in the garden or do much cooking. Most of what kept me busy was the 2015 EcoFarm conference at Asilomar, but I won't go into that now, I'm still trying to digest all the information that I was inundated with. Romanesco plant number two has started to produce, but this plant is behaving more like a sprouting broccoli, but in reverse. There are a number of side shoots forming from the bottom up while a small main head develops. Romanesco tends to be less hybridized than its broccoli and cauliflower cousins, so unnamed varieties tend to have more variation in how the heads develop. These shoots are just as delicious as the big beautiful pointy spiraled heads. I continue to harvest celery stalks for salads and other preparations. One head of Tronchuda Beira is still producing sweet tender leaves while the other one is showing signs of wanting to bolt. These leaves were cut up and wilted into a warm salad of Purgatory beans (a small white bean), shredded duck confit, carrots, and celery. I harvested the first small head of Sweetie Baby romaine lettuce from the fall sowing. This head was the perfect size to make two servings. And this is my first ever harvest of Michelle batavian lettuce (I had to try it just for the name!). This was a good sized head that I've used to make two salads and there's still enough left for at least a single serving salad. It's a crisp head type and the leaves are sturdy and crisp, even the outer ones are sturdy without being tough or strong tasting. My husband isn't generally fond of soft leaf lettuces, especially red ones, but I didn't hear any complaints when I served this one. I want to try it again for warmer weather harvests to see if it stays crisp and sweet. That's about it for the harvests last week, the only harvest not photographed were some China Rose radishes. I used the radish leaves again, they were delicious sauteed with some garlic and black sesame seeds, finished with a drizzle of sesame oil and a splash of fish sauce. Romanesco shoots - 1 lb., 7 oz. Tronchuda Beira cabbage - 1 lb., 1.4 oz. Dorato D'Asti celery - 13.7 oz. Michelle batavian lettuce - 14.3 oz. China Rose radishes (including greens) - 2 lb., 9.1 oz. The total harvests for the past week were - 7 lb., 7.3 oz. Which brings the total harvests for 2015 up to - 27 lb., 6.3 oz. I was playing hooky last Monday trying to hone my bread baking skills at a 2 day workshop so I skipped last week's harvest post so this post shows off two weeks worth of harvests. There's a few new or returning items in the harvest basket, most notably a head of Romanesco that suddenly demanded to be harvested. I used 1 1/2 pounds of florets to make a gratin with a cheese sauce and buttery bread crumbs (from one of the loaves from the bread workshop). That leaves another 3 1/2 pounds to enjoy in a couple more dishes. The latest sowing of Speedy arugula has taken a cue from the dry and relatively warm weather to try to bloom so I harvested a good sized bunch of it. It's not too spicy or bitter in spite of starting to bolt. That's what I like about Speedy, it stays mild when most arugula varieties turn strong tasting. This harvest of chard is not from the latest sowing, I sowed the seeds for these plants over a year ago on January 10 of 2014. They produced incredibly well through most of the year and then were hit with a severe powdery mildew infection in the fall. I stripped the plants down to the nubs and then they just sat through the cold and wet weather of December. Now that it's dry and warm again they've started to regrow. They probably won't produce a lot, they should start to bolt fairly soon, but it's nice to get a little something different. Ruby Gem is the one lettuce that I'm harvesting leaf by leaf. I love the contrast of the dark red and bright green. These leaves are small enough that I can arrange them whole on a plate to show off the pretty texture and colors. We've enjoyed a number of salads with this lettuce paired with winter fruits such as pomegranates or grapefruits and a simple vinaigrette. More lacinato kale went into the harvest basket. Other than pecking birds, the kale has been mostly unmolested by pests this winter. They generally get a pretty good population of aphids round about now, but the aphid population in general seems to be lower this year. I had to clear out the carrot patch to make way for shallot seedlings that were ready to plant out. Most of the carrots are on the small side except for the Muscades, not surprising considering it took me three attempts to get the carrot patch going last fall so they got a very late start. These are all waiting in the fridge for me to think of a way to use them. I also harvested a couple more big Spanish Black carrots that were volunteering in a different part of the garden, but those didn't get photographed. This is the first head of butterhead lettuce from the fall sowing. I was pleased and a bit surprised to see that some bulbs had formed in the fennel patch. They are growing from the stumps of the plants that I direct sowed into the garden nearly a year ago on January 20. I left the plants to bloom to feed beneficial insects and to provide a harvest of green seeds that I dried. Then I cut them down to the ground in December and they have struggled to grow back faster than the birds can peck away at the foliage. I hadn't paid them much attention lately other than to think that I need to get around to pulling them out. That may not be a perfect pale specimen, but it turn out to be delicious thinly sliced. It went into a salad with blood oranges, celery, hearts of palm and that head of Rhapsody butterhead lettuce. The celery continues to produce firm, crisp, sweet stalks that I'm harvesting stalk by stalk. The only other things harvested in the past two weeks were the Mikado baby turnips that I wrote about in my post about Braised Baby Turnips and Carrots and some radishes. I cleaned out most of the radish patch except for the China Rose radishes. I did pull some of the China Rose that looked like they were on the verge of bolting, they had small roots and huge greens. This variety is described as a dual purpose radish, both the roots and greens are supposed to be good. So I tried braising the greens and indeed, they are delicious and surprisingly mild. I had expected them to have some "bite" like rapini but they turned out to be totally sweet. I'll be sure to photograph the next harvest to show how big the greens are. Speedy arugula - 11.4 oz. Romanesco broccoli - 5 lb., .4 oz. Amarillo Yellow carrots - 1 lb., 1.8 oz. Deep Purple carrots - 11.1 oz. Lunar White carrots - 6.4 oz. Muscade carrots - 2 lb., .3 oz. Rotilde carrots - 11.5 oz. Spanish Black carrots - 11.7 oz. Dorato D'Asti celery - 14.5 oz. Golden chard - 3.9 oz. Peppermint Stick chard - 4.9 oz. Romanesco fennel - 6.8 oz. Lacinato kale - 13.4 oz. Rhapsody butterhead lettuce - 9.1 oz. Ruby Gem romaine lettuce - 5.3 oz. Pink Beauty radishes - 4.2 oz. Selzer Purple radishes - 3.1 oz. Mikado turnips - 27.4 oz. The total harvests for the past two weeks were - 18 lb., 4.2 oz. Which brings the harvests for 2015 to - 19 lb., 15 oz.